To contribute meaningfully in tomorrow's world, students and schools need to shift from FACTS to SKILLS. Unified Council offers products and services that help to accurately measure learning, promote self-learning in children and empower educators and schools. Unified Council offers various diagnostic tests for students of classes 1 to 12. These tests help pinpoint students’ strengths and weaknesses and also provide a benchmark with their peers. We organize and conduct these exams of UCO and NSTSE to students of Grade 3 to 10 in the school. CISK is also an Open Centre for the exam for few schools in and around Kothrud. 2] Instilling competitiveness in computer education. 3] Including logic, reasoning and mental ability in the learning process. 4] Identifying talent and assessing students on a nationwide platform. 5] Exposing students to the latest technology and study in computers. The important skills like the ability to think independently and reason logically - critical in today's world - are emphasised in this test. 2] Has interesting questions that require thinking, not simply recall. 4] Provides a benchmark of the student's performance with peers all over the country. 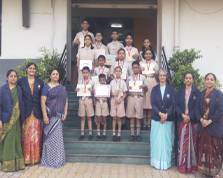 The students enthusiastically participate in this UCO and NSTSE and have won laurels for the school by winning State and National Level Results.